If you use Maven, you can include this library as a dependency. Add the following to your app’s build.gradle file, inside the dependencies section. 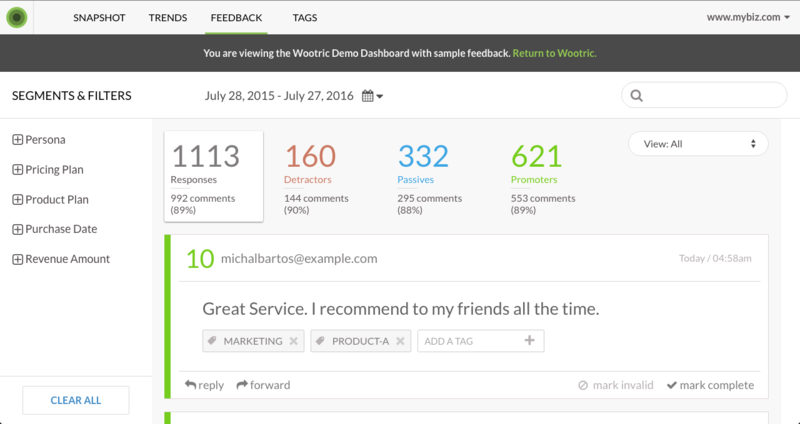 WootricSDK task is to present a fully functional survey view with just a few lines of code. Add the internet permissions to the AndroidManifest.xml file. Add the following to your ProGuard rules file. First import the SDK into your Activity of choosing. Then configure the SDK with your client ID and account token. The client_id can also be found on your Settings page, on the API section. 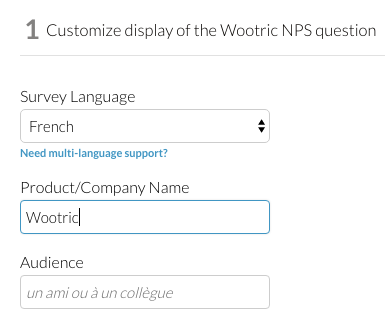 To display the survey just use wootric.survey();. If the user is eligible (this check is built in the method) the SDK will show the survey. Comment out the line wootric.setSurveyImmediately(true) when you are ready for production. Alternatively, leave the line in the code for testing purposes or to survey the customer upon every visit to a view. Step 5. 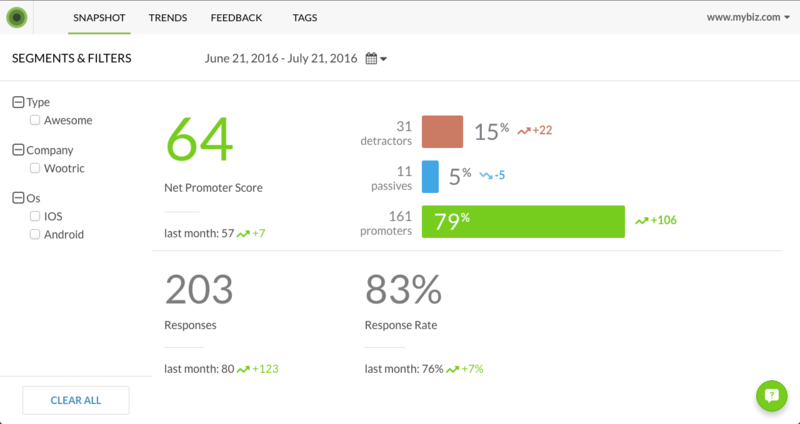 View your Responses Live! For a working implementation of the Android WootricSDK, try the demo app on our Github repo. If setSurveyImmediately is set to true and user wasn’t surveyed yet - eligibility check will return true and survey will be displayed. When creating a new end user for survey, it will set the external creation date (so for example, date, when end user was created in your Android application). This value is also used in eligibility check, to determine if end user should be surveyed. End user properties can be provided as a HashMap<String, String> object. If setShowOptOut is set to true then opt out link will be seen. setProductName sets the product name for the end user. This will change the default question. e.g. How likely are you to recommend productName to a friend or co-worker? setRecommendTarget will substitute “friend or co-worker”. It also takes precedence over values set in admin panel. Colors can be customized for the smartphone’s version. 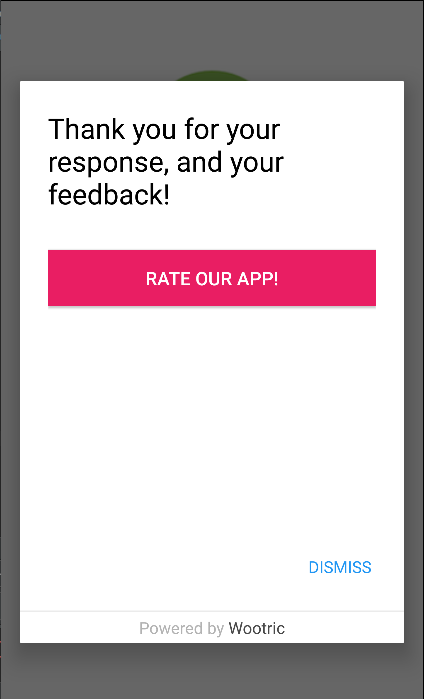 You can set the last button to go to the Play Store so users can rate your app. Does the SDK work with Amazon devices? Yes, the SDK has been tested with Amazon devices. This library is distributed as Android library project so it can be included by referencing it as a library project. It is assumed that Segment’s android analytics is available. The latest version can be added as dependency this way. Analytics object should be initialized in the Application class, specifying that the WootricIntegration should be user. 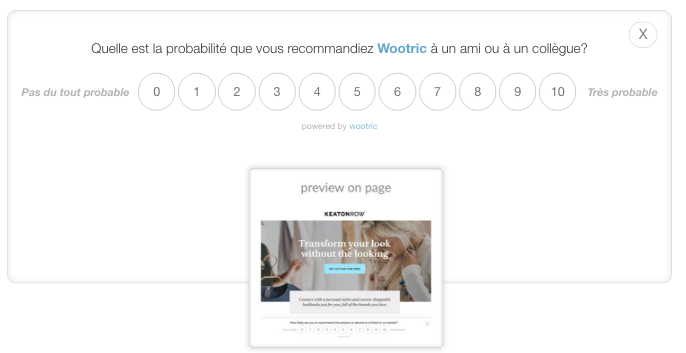 In your Activity of choosing the Wootric object can be used to set all optional configurations and call survey() method. Instructions on how to setup the mParticle Android SDK can be found on mParticle’s Github.